You have probably been looking at so many courses that it's starting to make your head hurt. There are so many and you're getting conflicting messages about whether or not online TEFL is worth it or worthless. 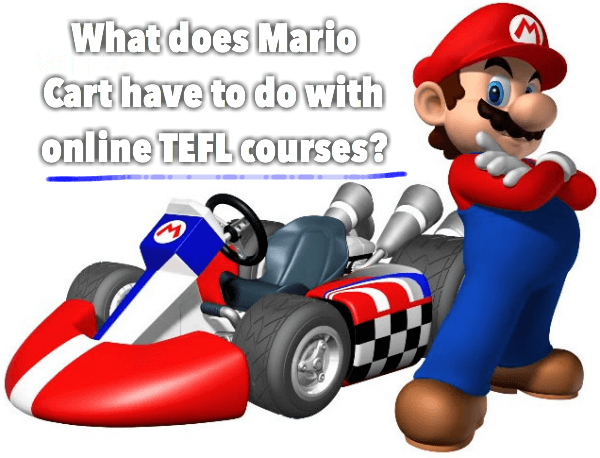 This is Mario Cart and in this post I am going to answer your question about whether online TEFL courses are worth it or not. A 10 year old boy named Griffin Sanders went out for a drive with his 74 year old grandmother and little 4 year old brother in Colorado. As they got onto the highway and reached a speed of about 60MPH his grandmother had a heart attack and passed out at the wheel. He tried to awaken his grandmother, but couldn’t. He got control of the wheel and then drove the car through oncoming traffic and safely to the side of the road saving himself, his brother, grandmother and all the other drivers on the rode. When the police arrived on the scene they asked him, “how did you do this?” He said, “Mario Kart”. First we'll look at the problems with online courses, then we'll look at the benefits and by the end of the article you will be more certain if online TEFL is right for you. What are the problems with online TEFL/TESOL courses? First off remember that all online courses are not the same, however here is a potential list of problems. Online courses are not for traditional learners. The traditional classroom environment is absent. Students must be self-driven to succeed. Some are just text based which makes the information go in one ear and out the other. Some schools won't accept them. It's not regulated and the quality can vary considerably. There is no one accreditation for TEFL. Creating an online course is easier than an on-site course. Feedback may be absent. It depends on the course. Again these are some potential problems. All courses are not the same, but lets take a closer look at some of these problems. Will 6 hours of classroom observation in a classroom based course make you or break you? A lot of the people who make comments against online TEFL courses are proponents of CELTA. Some are snobs and others are pro in-class or just doubt the validity of online courses. Most in-class courses do not offer any more than 6 hours of in-class training. In-class training is good, yet it's only 6 hours. It may be o.k. training, but that's just the equivalent of a day of work teaching in Korea. I have taken online courses and on-site courses. While many on-site courses make a big deal about in-class training, an important note is that this in-class training is often done with "pseudo" students. The students that you are teaching in front of are other people like you who are taking a TEFL course. They are NOT REAL students like the ones who you will actually be teaching. Ideally a course should teach you to teach the students you are going to teach. If you are going to be teaching mostly kids in Asia then you shouldn't learn by watching "pseudo" adult students teach, you should learn by watching teachers teach kids classes. In my experience teaching in Asia only a few schools won't accept online courses. I'd say that number is less than 5% out of all the jobs out there. In Busan, Korea the EPIK program requires those who don't have related degrees or experience to have taken an TEFL course with 60 in-class hours. That's only in Busan through EPIK. In other cities with EPIK plenty of teachers have gotten in with an online TEFL. The schools that don't "accept" them are usually some of the more "prestigious" or high-end schools. These schools don't employ teachers without experience. Although these positions are usually reserved for seasoned teachers with experience and not first time teachers regardless of whatever TEFL/TESOL/CELTA course they took. Experience - extensive experience especially in the country you are applying to is usually the best qualification. Licensed teachers - a school may want you to be a licensed teacher in your home country. Master's degrees - a few of the more prestigious schools such as some universities may require you to have a master's degree. In-class courses and the above qualifications are more common in the Middle East and parts of Europe. Other than that they are accepted in most of Asia. So an in-class course may appeal more to some schools yet keep in mind it's still not "real" experience. I totally agree with the above statement and I taught in Asia. It's less likely that an online course would be rejected because of its name or brand or whatever. If you enjoy the comforts of the classroom: a teacher and fellow students, then an online course might not be for you. Online learning is best for self-driven and motivated students. If you think that you will need a lot of support or motivation then take an on-site course. And I don't mean that in a sentimental way. They are not memorable in the sense that you will not remember what you learn. Some courses use only text to deliver information which can be really boring. I took one of those cheap Groupon courses and there was no video, audio or interesting graphics. The only images that they used were generic stock photos that were hardly related to the topics being studied. What are the benefits of online TEFL courses? I can't speak for all online courses as they are not all the same. Cost. While they can range in price from $8-1200+, they are cheaper than in-class courses. You'll save money. Access. An in-class course is a one time deal. Access to online TEFL courses typically ranges from 2-6 months. Convenience. You can usually take them when you want, you don't have to wait and you can start now and take them at your own pace. You control the pace, usually. They're GREEN! It's all online. Aside from electricity there is no waste or environmental foot print. You won't spend money on gas or transportation. Trees aren't chopped down for paper or books that just end up in the trash. I got several big books from the in-class course that I took and like her they weren't useful and they just ended up getting thrown out. Memorable visual learning. These courses are built with practical and authentic how-to videos that were shot in real classrooms w/ real students mostly in South Korea. Training especially focused on teaching children in Asia. Long term access. Learning takes time and many courses will only give you 2-3 months. Learn more about the benefits of online TEFL courses. ESLinsider offers practical and engaging multi-media courses especially targeted at teaching young learners (largest part of the job market in Asia). Instead of being stressed out about your new job and thinking to yourself this is nothing like what they taught me in that course - Imagine saying to yourself, "Oh yeah, these kids are like those videos that I watched in ESLinsider's course, I know what to do." Instead of working for a sketchy employer, with horrible management, and off the wall children - imagine working for a fantastic employer with great facilities, management that cares, and cute kids grinning from ear to ear. How amazing would that be?